Wanted to pass along an opportunity to help out folks in your community & also to help a friend of our very own Coach Janice. Melissa Focardi is the 7-year old daughter of one of Janice's best friends. 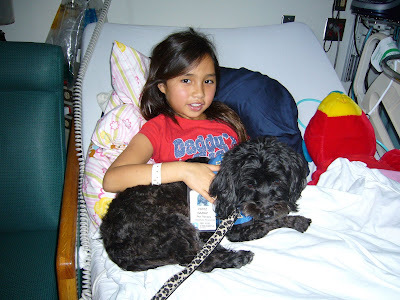 Melissa was diagnosed on 1/17/08 with Acute T-Cell Lymphocyctic Leukemia. Melissa is currently undergoing chemotherapy treatment & is need of blood donations during the process. Melissa is blood type O+. She is being treated @ Miller's Childrens Hospital in Long Beach. * Interested donors, call (562)933-0808 to make an appointment, ask for Jesse & mention it is for Melissa Focardi. Please do not feel pressured or obligated. Just wanted to pass this along to those that are interested. Please consult with your Health Care Professional regarding the donation process as appropriate. And stay away from strenuous physical activities like Power-10s around the time of the donation. Any questions please don't hesitate to contact Janice or Jesse @ the hospital. Thanks All. And feel free to pass along. Space Dragons Love (Happy Valentines Day! ).